Alright, we do not disagree. The Orthodox Church does not celebrate birthdays. Rather, we celebrate our rebirth/regeneration in the Lord. This regeneration is associated with the new name God gave a person, not with the birth of a person. As for the Lord Jesus Christ, whose birth we do celebrate, the Lord is not simply any man. He is God who became man! And herein lies the core of the issue. He is not simply a man, but the GOD-MAN. Such reasoning does not apply to Him for the celebration of His birth. Therefore, there is no pagan celebration, but a celebration of honor for the person of our Lord, as well as the entire activity of the Church, which is an action of the Grace of God, bestowing sanctification through the event of His own incarnation both in time and space. 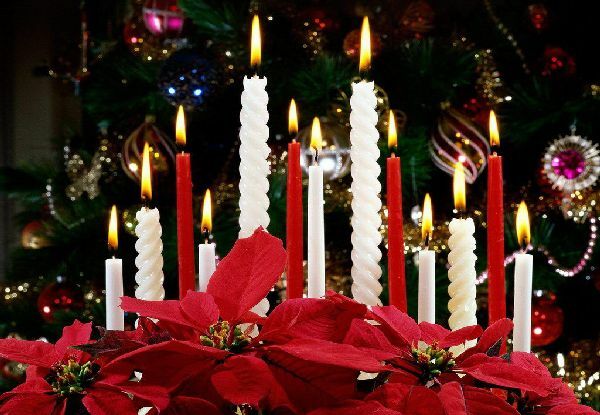 It is precisely this sanctification of creation that is pursued by the Church and her individual members, and for this reason we celebrate all of these divine events, including the very important event of the Divine Incarnation that the Christian Church celebrates during the feast of Christmas. As we previously emphasized, the climax and center of the celebration is the Divine Eucharist, the Lord’s Supper, and in this there is no objection and doubt. Within this event, Christians celebrate the entire Divine Economy, which of course includes all the stages and phases of the Divine Incarnation, and the salvation of the human race which it entails. However, let us look at this important event through some passages of Holy Scripture. First, let us look in the book of Exodus (3:5). There God says the following to Moses, where He appeared amid the flaming yet unburnt bush: “Take off your sandals, for the place where you are standing is holy ground.” Therefore, the place was sanctified by the appearance and presence of the Lord. Time is also sanctified in a similar fashion. We will refer to a small example from the book of Nehemiah (8:8-11): “They read from the Book of the Law of God, making it clear and giving the meaning so that the people understood what was being read. Then Nehemiah the governor, Ezra the priest and teacher of the Law, and the Levites who were instructing the people said to them all, ‘This day is holy to the Lord your God. Do not mourn or weep. '” And we note here, that this day was the first day of the eighth month. This was not an established feast of the Law. Here takes place a happy occasion, an occasion which is related to the return of the Israelites from Babylonian captivity, and the people of God define it as a holy day, and in this way it is essentially legislated by the people of God and sanctified, thus sanctifying time. We return to the text: “For all the people had been weeping as they listened to the words of the Law. Nehemiah said, ‘Go and enjoy choice food and sweet drinks, and send some to those who have nothing prepared. This day is holy to our Lord. Do not grieve, for the joy of the Lord is your strength.’ The Levites calmed all the people, saying, ‘Be still, for this is a holy day. Do not grieve. '” We see then, how they established this day as holy, as a feast day, and how Nehemiah and Ezra urged the Israelites to celebrate. Therefore, what was the way by which it was suggested indirectly by God to celebrate this holy day? It was the reading and interpretation of the Law, the word of God, as well as physical delight, and this was done by means of a table with foods and drinks. At the same time, this table had character and was social, showing mercy to those who did not have the means to feast. The holy day, the feast of the Lord, includes the joy of all people, and so all Christian feasts should be celebrated. Of course one should abstain from drunkenness and debauchery which removes one from the purpose of the feast, and it should rather be one of praise and glory to the Lord, but also physical delight.